Sealaska Heritage Institute (SHI) will announce winners of its ninth, biennial Juried Art Show and Competition and its second, biennial Juried Youth Art Exhibit next week during Celebration 2018 and give awards for the best pieces. The shows are open in tandem with an exemplary works exhibit that features old pieces made by master artists, said SHI President Rosita Worl. The goal of the competitions is to encourage the production of Northwest Coast art that reaches for the highest standards set by our ancestors, and master artists have encouraged younger artists to study the old pieces to improve their work, she said. “The complexity and level of workmanship evident in old pieces of Northwest Coast art made by our ancestors is astonishing. We sponsor competitions and exhibits of exemplary work to encourage our artists to always strive for that level of mastery and to make our ancestors proud,” Worl said. The Juried Art Show includes more than 40 works by nearly 30 artists. Winners will receive prizes in the following divisions and categories: Carving and sculpture division, which includes categories for wood and metal; 2D and relief carving division, which includes categories for paintings and relief carvings; sewing division, which includes categories for skin and fur, beadwork and capes/robes regalia; weaving, which includes categories for Chilkat inspired and basketry work; and endangered art division, which includes spruce root basketry. Artists who win Best of Category will compete for Best of Division, and the division winners will compete for the Best of Show prize. SHI also will award a best of formline prize and a second-best formline prize among all pieces submitted. The institute’s Native Artist Committee, which is comprised of celebrated Northwest Coast artists who guide SHI’s art programs, recommended artist Jackson Polys and art historian Steve Henrikson to serve as jurors. Master Haida weaver Delores Churchill served as a juror master artist on sewing and weaving submissions. Jurors reviewed the pieces blindly, meaning the names of artists who submitted pieces were not disclosed. The show is on exhibit through Sept. 30 in the Nathan Jackson Gallery at the Walter Soboleff Building in downtown Juneau. The Juried Youth Art Exhibit showcases 30 pieces by 25 individual young artists from Anchorage, Angoon, Craig, Juneau, Ketchikan, Klawock, Metlakatla, Sitka and Ward Cove. SHI will award $350 for first place and $200 for second place for competitors in middle school and $500 for first place, $350 for second place, and $200 for third place for competitors in high school. The funds will go to the school or organization identified by the winners that gave them instruction in Northwest Coast art. All youth chosen to exhibit will receive a specially-made Juried Art Show t-shirt and winners also will receive a certificate. The show is on exhibit through June 30 at the Juneau Arts & Culture Center. The exemplary works section of the exhibit features art from the institute’s collections, including a Chilkat robe that was generously donated to the institute in 2017 by Bruce and Gretchen Jacobsen of Seattle; a carved horn spoon and a spruce root basket that highlight endangered traditional art forms; and a carved sperm whale tooth that demonstrates the quality and elegance of Northwest Coast sculptural design. 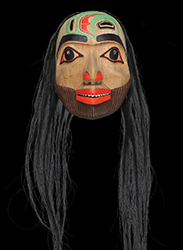 The exemplary pieces underscore the institute’s quest to recognize Northwest Coast art as a national treasure. The show is on exhibit through Sept. 30 in the Nathan Jackson Gallery at the Walter Soboleff Building in downtown Juneau. The exhibit is featured by SHI’s new exhibit, Our Grandparents’ Names on the Land, which explores ancient place names and the innovative inventions that were used to catch halibut and salmon. Winners will be announced at 4 pm, Wednesday, June 6, in the clan house at the Walter Soboleff Building in downtown Juneau. Major sponsors of Celebration 2018 include Sealaska, Alaska Airlines, Southeast Regional Health Consortium, BP Alaska, Rasmuson Foundation, Sitka Tribe of Alaska, GCI, Salon Cedar, Southeast Stevedoring Corporation, Wells Fargo Foundation and Wostmann & Associates. A list of all sponsors will be published in the Celebration program and broadcast during the event. The Best of Formline award was sponsored by Goldbelt Corporation, and the Juried Youth Art Exhibit was sponsored by Kathy Ruddy of Juneau. Caption: Shaman’s Apprentice by Sgwaayaans (TJ Young) is one of more than 40 pieces accepted into SHI’s 2018 Juried Art Show and Competition.